One of the strongest symbols of Amateur Radio is the historic building that has graced the land at 225 Main Street in Newington Connecticut since 1938. Over the decades thousands of hams have walked through the doors of W1AW, awed by the storied traditions embodied there, from the cases of equipment to founder Hiram Percy Maxim's spark gap "Old Betsy." Even today visitors from all over the world come to ARRL Headquarters to experience the unique history of W1AW and to operate from one of the state of the art suites to contact hams back home. 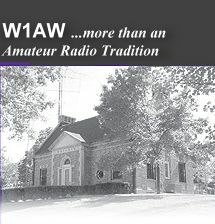 We hope that the tradition of operating W1AW never ceases.